Tobías is sitting in his garden playing the Lira and suddenly he sees an angel. He's wearing a long tunic and sandals he has big beautiful wings, they walk the dog around the mountain hill, when they see the neighbors having a barbecue and they invite them. Tobias is sitting in his garden. He’s looking at the sky, and then he gets up and he walks around the river with his dog. Suddenly he finds an angel in the road and they walk happy together. Tobias sitting in his garden and he is thinking about the universe in his garden, because he is seeing the beautiful colours of the country, the blue sky and he can also hear the water running in the river. Tobias is a very good fisherman and he goes nto fish to invite his best friend: the Angel and his old dog. But the dog isn’t very happy because it prefers meat. Tobías is sitting in his garden with his dog; suddenly an Angel comes and says: “ Let's go for a walk to the river to fish”. They are fishing for a few hours but they take only one fish. Later they play with his dog throwing stones to the lake. When suddenly the dog is missing they look for it everywhere but they listen to the dog barking. The dog's bark is coming from a castle they run to the castle and they can't belive! The dog has two fishes. It's fishing more than us. Then, They cook the fish and drink wine while they watch the landscape. At night the Angel returned to heaven. “See you, Tobias!, the angel says. “ See you, Angel,!” Tobias says. Tobias is very happy, he has a new friend. Tobias is sitting in his garden, his garden is very big, with many trees and plants, he’s fishing in the lake, when suddenly, an angel goes down from the sky. 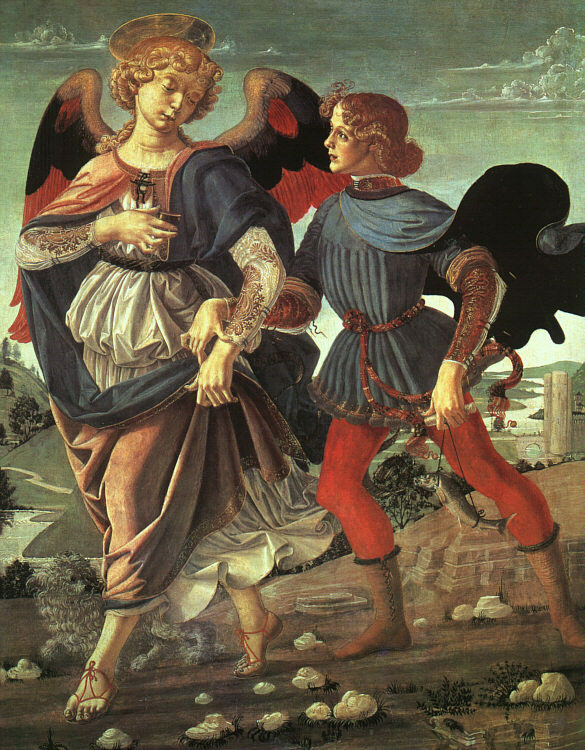 The angel tells Tobias: “Come with me, take my hand, let’s go for a walk together, and I’m going to tell you a story”. The story is about a child who doesn’t have parents, and he is very sad. His mother died when he was born and his father died in the war. The child lives alone and has to beg to eat, until one day finds a rich man who took him to his house. He lives better, but unhappy, because he can’t play with his friends. The angel tells him: “Wealth doesn’t bring happiness”. Tobias is sitting in his garden, He´s playing with his dog, after one hour He goes to fish in the next river, He catches one fish, then He goes to the castle and when he´s walking, suddenly he sees a man. When he´s near, he sees that he is an angel. He´s very happy! Tobias is sitting in his garden looking at the sights of his lands and playing with his dog. Later he reads a tales book and then he goes to sleep. Suddenly, an angel appears in his dream. He’s very scared but the angel calms him. Then Tobias and the angel go to fish to the river crossing the forest. His dog goes with them. Tobias fishes a big fish and later they cook and eat the fish. In the evening they come back to Tobias’ castle. When Tobias wakes up, he is alone. His dog is playing with him and there isn’t any angel. Tobias is sitting in his garden, he is reading a book about god. Tobias and friends are having a fish barbecue and for dessert they have greek yoghurt. After lunch they play cards and suddenly Tobias’s friend goes flying to the sky. Tobias is alone and he is bored, then he goes to sleep. -Hello, I´m hungry, can you give me a piece of fish please? -No , I have only one. But if you want to eat, you can take my dog and prepare Hot Dogs. -Ok , but I don´t have Moustard. Tobias says: No problem, I can give you. Finally, the Angel accepts the dog and the moustard, and the Angel is going back to Heaven. Tobias is sitting in his garden, he is playing with his dog and suddenly it´s starting to rain and he is going back to his castle. In his castle, his wife is waiting to him for dinner. After dinner, they start to read a new novel when they have a phone call and they say that his dog is lost. Finally, they´re looking for his dog in the river, then the dog appeared behind the trees. One day, Tobias is sitting in the garden. He´s playing with her dog, when suddenly… he sees an angel. He´s wearing a long tunic and sandals. They go for a walk near the river and both eat fish in the hills. 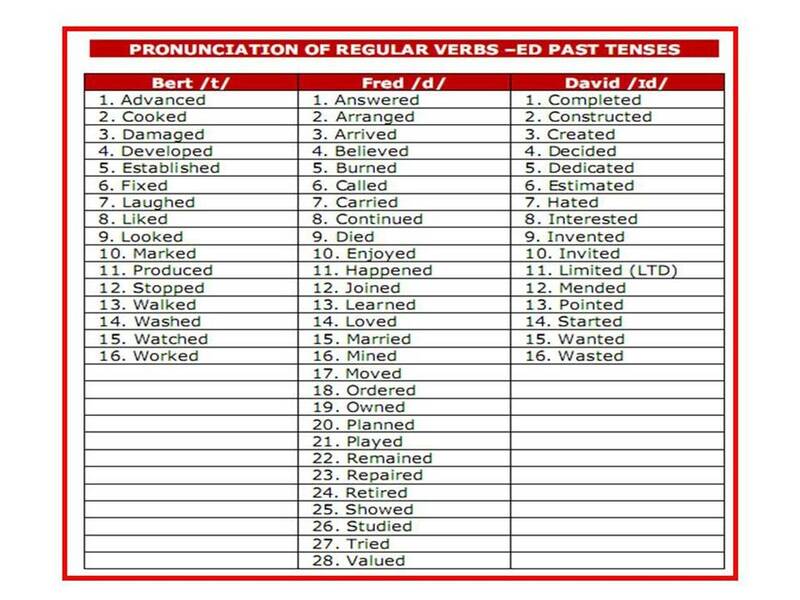 See the following table and practice the verbs. This blog is intended for Basic Level students of English. 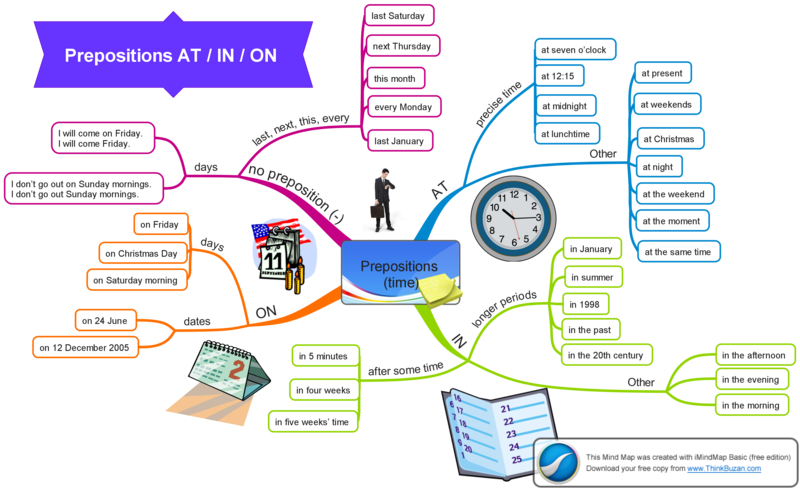 Here you can find some useful help to improve your English learning. 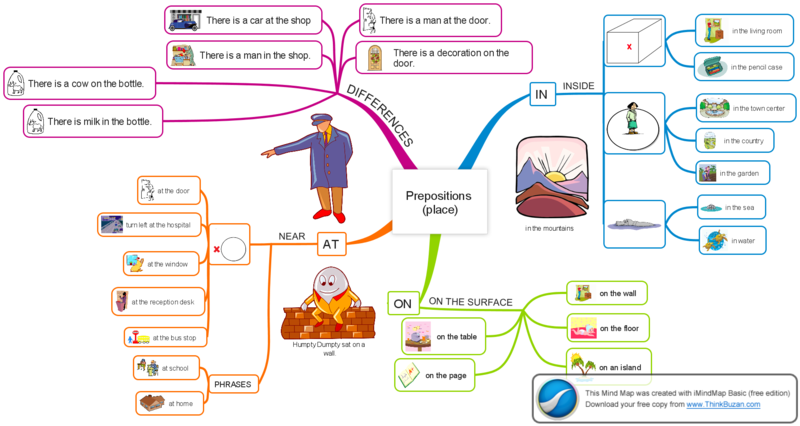 There are many mind maps which you can download and use as a tool to learn new vocabulary. You can also print them in colour and have a beautiful picture to check regularly. This will help you to store the new words in your memory. Enjoy them! Hope you may find this blog useful! DIALANG is a programme where you can learn about your strengths and weaknesses in a foreign language, and find out what level you are at. Click on the image to download it. This is an e-portfolio created to help you develop your capacity to reflect on objectives, ways of learning and success in language learning, as well as plan and assume more responsibility for your own learning. It is important to register to access to it. The Guardian Left of centre top quality daily. The Independent Daily liberal broadsheet with a wide international coverage. The Mirror Tabloid, traditionally supportive of the Labour party. The Telegraph Well written conservative broadsheet. The Times Slightly conservative, the oldest British national daily. Future Movies British movie review guide features profiles of new movies, cinema releases and latest DVD film reviews. Includes interviews and filmmaking news. Hello! UK entertainment magazine offering news and pictures from the world of celebrity, royalty, entertainment, film and music. In Style Articles on celebrity fashion, clothes, shopping, and entertaining. National Geographic Celebrates journeys that are about place, experience, culture, authenticity, and great photography. Makes a distinction between tourism and travel, and stresses inquisitive not acquisitive trips. People Weekly magazine with all the latest celebrity and popular culture news. Guide to who and what are hot in the arts, politics, television, movies, books, music and sports. Time Magazine The official home of TIME Magazine online, presenting the top news stories of the day and current events from around the globe. Why not a subscription to my blog?